I have long thought that it would be interesting to do a day-by-day retelling of the Battle of Britain through the use of art. Having collected images relevant to time specific events, I will present them in the format of "This is what happened on this date in 1940". I have taken the liberty of standardizing some of the text (which will be accredited) such as ranks, unit and aircraft designations. Grammatical errors have been corrected. One hundred and thirty-one artworks from thirty-five artists have been assembled to date. So gather your serviceable flying kit, take a spot in the shadow of your Spitfire's wing and await the sound of the siren. A multitude of images of Bf 109s, Bf 110s, Defiants, Do 17s, He 111s, Hurricanes, Ju 87s, Ju 88s and Spitfires are headed your way. hoho... looking forward to follow this thread developing. 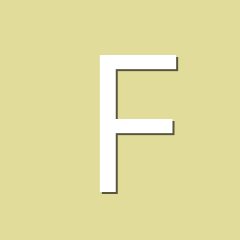 Should we stay silent and just enjoy or comment and discuss while the thread is expending ? Open question to everyone here, if the answer is silent, then we could clean the thread just after the 1st message of Roger before the 10th of July. 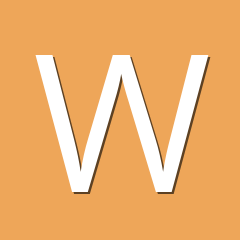 Should we stay silent and just enjoy or comment and discuss while the thread is expending ? Good question Vincent, and thanks for asking it. I encourage anyone to comment at any time. There are days where there will be as many as twelve images displayed and sometimes a span of over a week where I haven't been able to find anything depicted. So there will be an ebb and flow to the thread, just like the battle. Also, if anyone notes a date specific artwork that does not get shown, please send me a link to it and I will splice it into it's proper place. Looking forward to it, Roger! 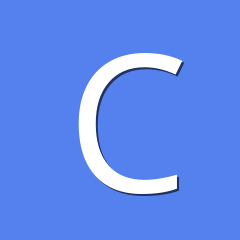 Sounds like this will be an epic thread that should be a sticky when complete. I just emailed you my one and only BoB piece, a small work based on a photo I found in a BoB book. Not much, but perhaps it will fit in somewhere. The image and description that you sent will indeed find a place. Watch for it on July 29! I'm also looking forward very much to getting a good blow-by-blow account of the battle, with a bonus of the art. I will definitely print daily hard copies to add to my BoB files. I imagine the images will tend heavily towards the RT, NT, and MP variety (as they should!). With the Battle of Britain in it's early stages, on the morning of Wednesday, 10 July 1940, a convoy of slow-moving cargo ships heading along the south coast came under attack from a formidable force of Dornier Do 17 bombers, escorted by five squadrons of fighters. RAF Fighter Command scrambled several squadrons to meet the oncoming force in an effort to protect the ships, and a massive dogfight involving more than a hundred planes developed in the region of Dover. Ripping into the oncoming bombers, the RAF fighters attacked head-on, a hazardous tactic requiring great courage, but highly effective in unnerving bomber crews, causing them to swerve out of formation and abandon their target. Head-on collisions were not uncommon. The great battle raged well into the afternoon, and by evening the insurgents had been driven back to their bases in France to lick their wounds. Only one direct hit was scored by the enemy, when a 700 ton sloop was sunk. The Luftwaffe lost nineteen aircraft, and although the RAF had seven aircraft damaged, it lost only one pilot that day. 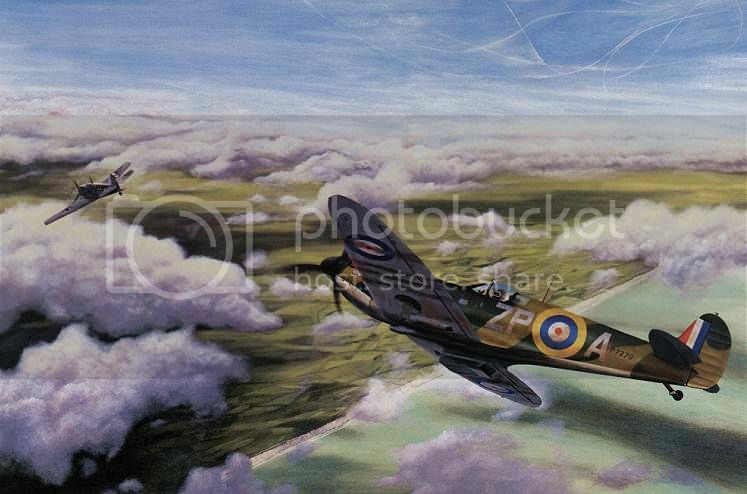 Robert Taylor's painting captures a head-on attack between two seasoned pilots high over the port of Dover in the late morning of 10 July 1940. A Supermarine Spitfire from 610 Squadron, flown by Squadron Leader Andrew Smith, has taken on a Me l09 from I./JG 3, the two aircraft having flashed past each other at a closing speed nearing 800 mph. Smith was forced to crash-land his damaged aircraft at Hawkinge following this encounter, but the gallant squadron commander was to lose his life following combat with Messerschmitt Me l09s just two weeks later. Below the duelling aces, other aircraft contest the air above the old port, while the coastline is seen stretching west into the distance. 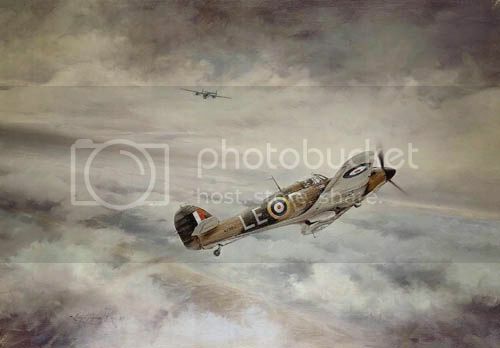 On the morning of 11 July 1940, Douglas Bader, the new commander of 242 Squadron took off alone in filty weather to intercept a lone intruder that had been reported in his sector. Here we see Bader as he breaks into the clear, and spots the enemy. Minutes later the Dornier crashed into the sea, the first victory for Bader and 242 Squadron. Great idea, Roger, and thank you for creating this thread! 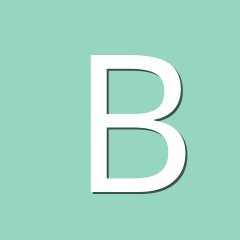 I myself had started doing this many years ago when I first started the site, and have created a few pages for some of the most significant events which are popularly depicted in aviation art, such as BoB, hunt for the Bismarck, the Doolittle Raid and the shooting down of Yamamoto. You can see the links to these pages on the homepage in the Popular Searches box. On July 19, 1940, only three days after Hitler issued Directive No. 16, his preparation for the invasion of the British Isles, Stukas raided Dover Harbour, and Hurricanes of 32 Squadron based at Hawkinge were scrambled to intercept. 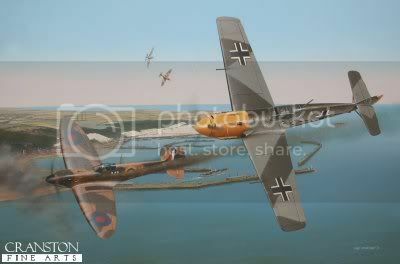 Flying through the Dover flak defences to engage the Stukas, the Hurricanes were set upon by Bf 109s of JG 51. 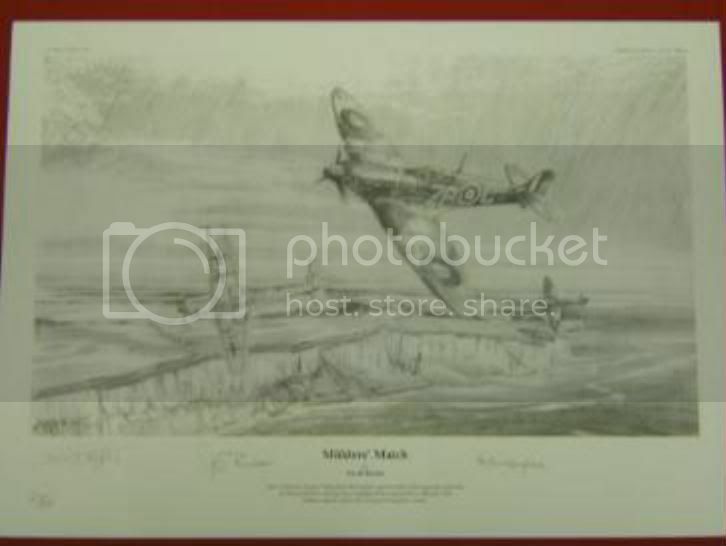 At 11:43 hrs, Peter Brothers brought down one of the Messerschmitts, his first aerial victory of the Battle of Britain. The long summer struggle for ultimate victory for the RAF's "Few" had begun. Before dawn on 20 July 1940, Blue Section of 56 Squadron intercepted and shot down a Ju 88 of 4(F)/122. Pilot Officer Geoffrey Page achieved a shared victory flying his Hurricane Mk I "Little Willie". With their spinners painted blue for identification, Alan Geoffrey Page, F/Lt "Jumbo" Gracie and Percy Weaver comprised the Blue Section. Their bogey, the Ju 88 was on a photo recon mission. The Hurricanes chased the bomber in and out of the clouds; this scene shows just after "Jumbo" Gracie fired then peels away and Page gets in his last burst before the Ju 88 disappears in a cloud bank. Blue Section was not sure they scored a victory until it was reported that the Luftwaffe bomber had crashed at Cockett Farm, St Osyth. Blue Section shared the victory. One of the RAF's most delightful and distinguished gentlemen, another perfect example of "... one of the few", Geoffrey Page ended the war with 15 victories. Image and text from Eagle Editions Ltd.
"It was Saturday, 20 July 1940. Following what was becoming normal practice, we deployed to Hawkinge, on the Kent coast, from Biggin Hill, where we spent a quiet morning and what turned into a noisy afternoon. "About 5 pm, No 32 Sqn was ordered to patrol over the convoy BOSOM, which was some ten miles east of Dover, steaming north-eastwards. Led by Sqn Ldr John 'The Baron' Worrall, the nine of us, happy to be relieved of the boredom of waiting around on the ground, took off to perform the dull job of patrolling up and down a line of ships, which we duly did for a while. Over the convoy, we were joined by ten Hurricanes from No 615 Sqn and, to the west of us, nine Spitfires of No 610 Sqn were also flying their patrol at a higher altitude. "Towards the end of our patrol, 'Sappa' (our ground patrol) warned us of enemy aircraft approaching from the south-east, and sure enough there they were - a force of at least 50 aircraft, comprised of Ju 87s escorted by Me 109s and Me 110 Jaguars. Happily, we were 'up sun' of them, and I think unseen. "As the Ju 87s started their dive, 'The Baron' led the six aircraft of Green and Red Sections down to bounce them. I was about to follow with Sub Lt Gordon Bulmer and Sgt Bill Higgins when I saw about 30 Me 109s taking an unwelcome interest in us, so I swung Blue Section around to attack them. 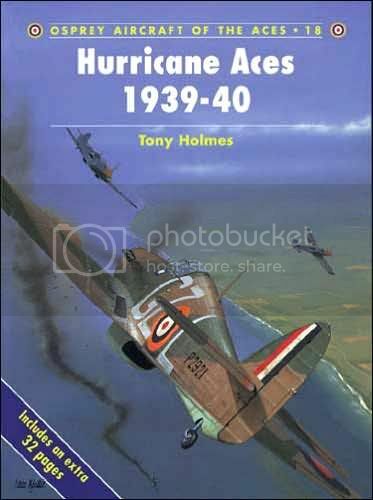 This seemed to offend them so much that they picked on my section of three Hurricanes instead, and from what had been a peaceful sky suddenly erupted into a confused melee of aircraft swirling round firing at anything in sight. "One of the Messerschmitts overshot me, and I managed more by luck than judgement to get on his tail. Opening fire in five-second bursts at a distance of 150 yards and closing, I had soon set the Me 109 on fire. This made me even more unpopular with his squadronmates, and the excitement of the dogfight grew in intensity as four of them attacked me from different directions. I was not happy with such unfriendly attention, and made a head-on attack on two of them before running out of ammunition. As I wheeled round to guard my tail, I found that the sky had cleared and there was not an aircraft in sight - no friends, no foes, nothing. Feeling lonely and vulnerable, I made for home. "On arrival at Hawkinge I found that 'The Baron' had been badly shot-up and crash-landed near the airfield, fortunately with only slight injuries.Worse, Sub Lt Bulmer was missing. He had been with us but 20 days, and had little combat experience. Many years later I learned that he had been shot down by the ace Oberleutnant Josef 'Pips' Priller of I./JG 51. And although Bulmer had succeeded in bailing out of his stricken Hurricane, he had drowned. The afternoon of 25th July 1940 was a desperate one for the already exhausted fighter pilots of the RAF defending the South coast of England. As convoy CW8 made its way through the English Channel, sixty Ju 87 Stukas and forty Ju 88 bombers launched a brutal attack on the ships below, backed up by fighter cover of over 50 Messerschmitt Bf 109s. Eight Spitfires of 64 Sqn (Kenley) were scrambled, together with twelve Spitfires of 54 Sqn (Hornchurch) and Hurricanes of 111 Sqn from Croydon. The British pilots found themselves massively outnumbered, but nevertheless put up a spirited fight against the teeming enemy. 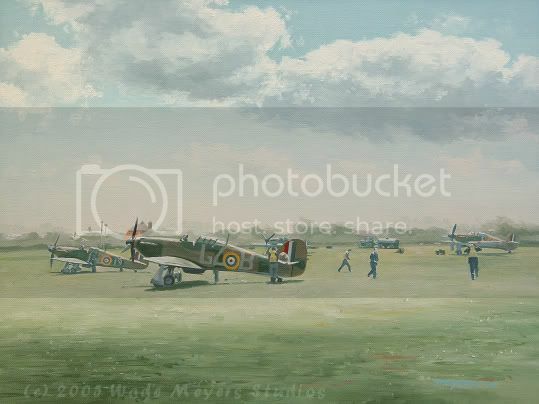 This painting shows Spitfires of 54 Sqn entering the fray, the pilots scattering as they choose their targets and go after the Ju 87s. To the right of this, Bf 109Es of JG 26 are roaring in to join battle, whilst Adolf Galland's aircraft engages a Hurricane of 111 Sqn. Adolf Galland claimed his 16th victory on the afternoon of 25th July 1940 when Spitfires of 54 Sqn were bounced by Messerschmitt Bf 109s of Galland's III./JG 26. 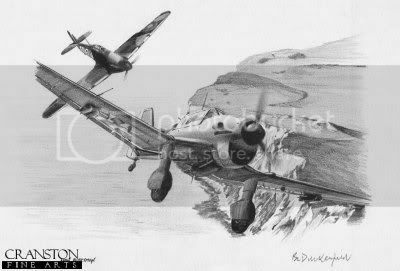 A fierce battle ensued off Dover during which F/Lt Basil "Wonky" Way, flying R6707, found himself the subject of the great German ace's attention, his stricken aircraft being observed to plunge into the sea after receiving numerous hits from the Bf 109's guns. F/Lt Way lost his life in the crash, presumed drowned. 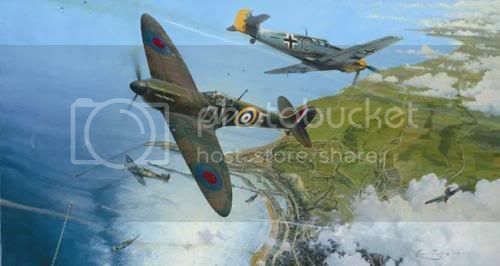 John C Freeborn, flying a 74 Squadron Mk I Spitfire, gets the better of the legendary Luftwaffe ace Werner Molders, during a fierce dogfight off the coast of Dover, 28th July 1940. Molders, injured, limps back to France, licking his wounds. On July 28, each side's top gun met near Dover. England's most famous ace, Sailor Malan, led his 74 Squadron to intercept approaching bombers. At the last minute, the bombers turned away. Malan's Spitfires then met the four escorting squadrons of Me 109s led by the equally famous Werner Moelders, inventor of the "finger four" formation. Moelders attempted to turn onto Malan's tail, but Malan was quick enough to preemptively turn into his foe and rake the Me 109 with gunfire from nose to tail, wounding Moelders in the leg. The German managed to disengage and nurse his ailing aircraft back across the Channel, where he crash-landed at Wissant. 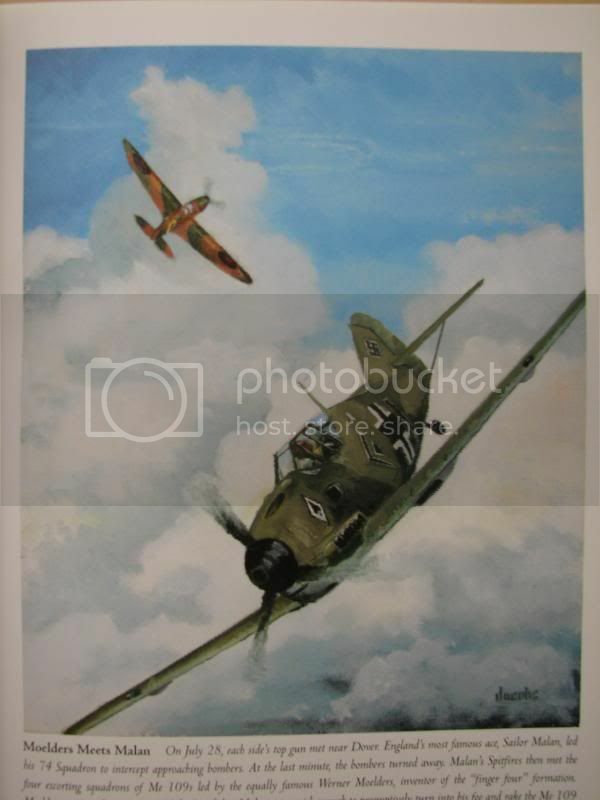 The painting depicts the Supermarine Spitfire piloted by "Sailor" Malan, in action against an Me 109 piloted by Kommodore "Vati" Moelders. This dogfight took place on Sunday 28 July 1940, over southern Kent. Malan damaged Moelder's aircraft and the Luftwaffe ace was wounded, but succeeded in returning to his French Base. 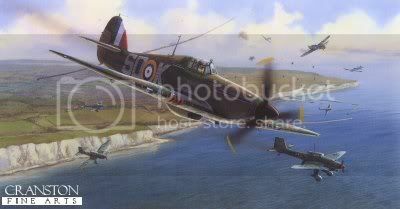 Byron Duckenfield is recorded as having shared in a victory over a Stuka near Dover on July 29th 1940, but the exact circumstances are not clear. 29 July 1940. The signal to scramble has just been phoned through, and the pilots and ground crew of 32 Sqdn at Hawkinge are preparing for takeoff. hey, I love this one! Way to go Wade! too bad there are no prints, I would jump right now! On July 29th 1940, the Luftwaffe launched what they believed was a surprise attack on the port of Dover and the shipping in the area. RAF controllers, however, were quick to react and Spitfires from Manston along with twelve Hurricanes from Hawkinge intercepted nearly fifty Stukas and no less than eighty fighter escorts. The battle was intense, and made even more dangerous for the RAF by the heavy flak which the gunners of Dover used to some success, shooting two Stukas out of the sky. At the end of the action, seven German aircraft were lost to just one Spitfire. More significantly, Dover was spared serious damage and no ships were lost. 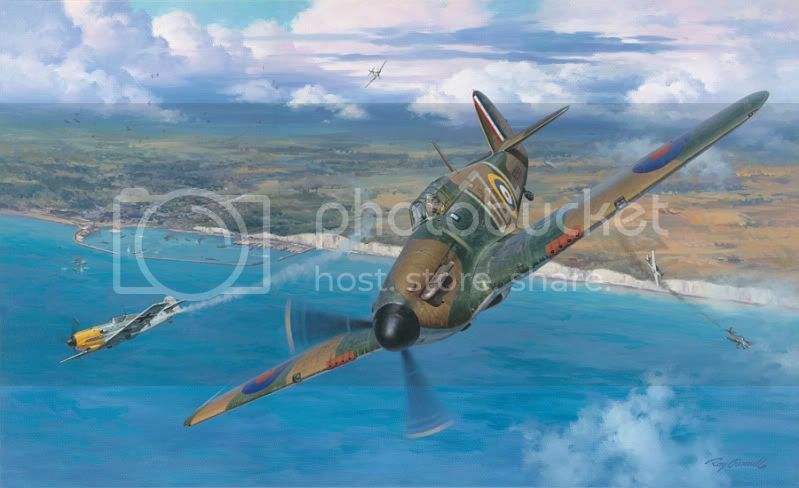 The painting depicts a Hurricane of 501 Squadron caught up in close combat with Stukas and Me 109s above the port, whilst in the background, many more aircraft can be seen joining the fray.